Camera calibration consists of determining essential parameters of the optics and of the sensor. Once a precise calibration is achieved, modules such as DemoArUco, FirstVision, FirstPython, and PythonObject6D can recover the exact location and orientation of a marker or object in 3D space. Start with a fresh Ubuntu 18.04 virtualbox. Follow the instructions at http://jevois.org/doc/Virtualbox.html but with Ubuntu 18.04. Beware: you may have problems compiling ARtoolkit with later versions of Ubuntu. 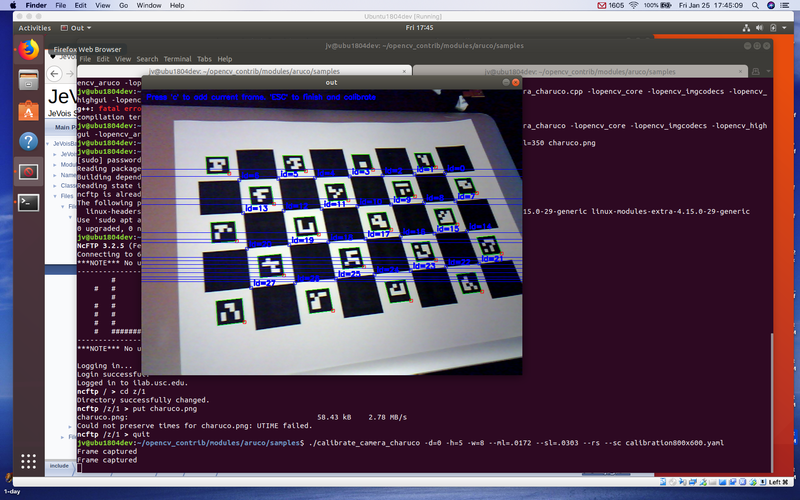 We will compile the OpenCV calibration code natively in our virtual machine. We follow the instructions at http://jevois.org/basedoc/ArUco_8H_source.html except that we will just use the default OpenCV that comes with Ubuntu as opposed to using the JeVois OpenCV. Then print it (you may have to first use scp, ftp, or other to send the file from your virtualbox to a computer that has a printer – or just get it from http://jevois.org/data/charuco.png instead), measure the marker size and spacing size (in whatever units you want, here we use meters, just make sure you will use that same unit later when you specify marker size in DemoArUco and others). This program was not able to capture 1600x1200 at 5fps in our tests. Just declare your mapping as 1600x1200 at 15fps and it will work fine though really it will stream at 5fps due to USB bandwidth limitation. You should aim your camera so that all the ArUco markers are detected. 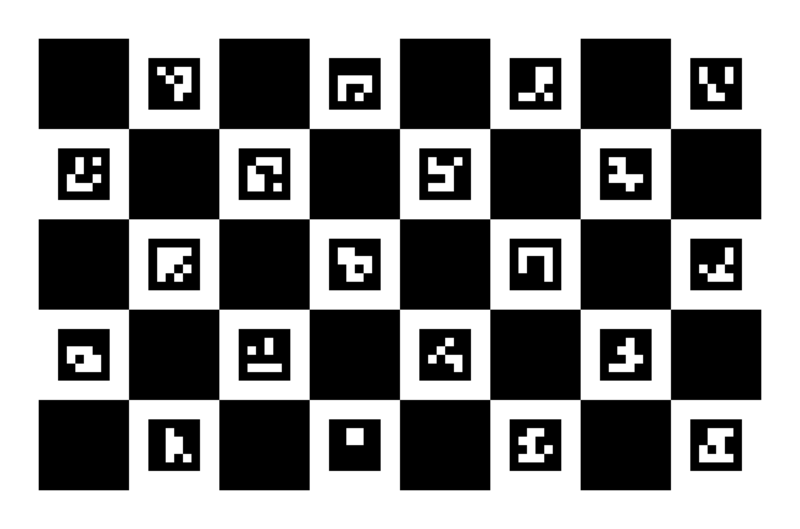 Press 'c' to capture the current image and add it to the calibration pool. To obtain a good calibration for the camera, it is important to obtain images of the calibration board at a variety of angles to the camera lens. Note that this involve holding the calibration board at different angles relative to the camera, including upside-down. Try to get at least 10 very different viewpoints. Once all the calibration images have been captured, press ESC and the calibration data associated to the camera device is calculated. The tabulated calibration data is written to standard out of the command-line window and saved to disk. Copy the calibration file to JEVOIS:/share/camera/ on your camera, naming it exactly: calibration1280x720.yaml for 1280x720 resolution, or change the name for different resolutions. Next time you run DemoArUco with that resolution, it will load the calibration file.